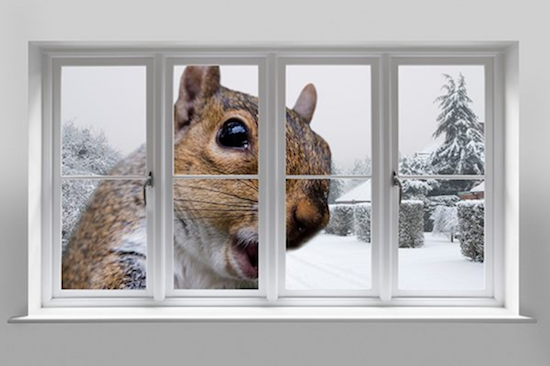 In summer, work is done to keep annoying insects out of the house, but winter can be even more of a challenge because some of the creatures trying to get in are bigger and harder to drive out. "Mice, rats, raccoons, squirrels, cockroaches, and ants will try to seek food and shelter inside homes as the temperature drops," says Jamie Nichols, senior service center manager of Arrow Exterminators in Atlanta. These critters can cause damage to the home as well as spread bacteria. Also, some, like raccoons and squirrels, can be difficult—and expensive—to get rid of as they require a professional exterminator. If grass and shrubbery is close to the house, keep it well trimmed. Use rocks and stones for ground cover near the home's foundation; material like wood chips could provide shelter for pests. Firewood is a favorite hideout for mice and rats. Place logs at least 20 feet away from the house, and elevate at least 18 inches off the ground. Keep stocked bird feeders away from the home, use squirrel guards, and clean up spilled seeds or discarded hulls. Any tree branches close to the roof could be a bridge for insects, squirrels, and rodents. Squirrels are especially skilled jumpers, so trim branches back at least eight to ten feet from the roof. Termites, ants, and roaches are all drawn to moisture, so make sure gutters are clean and downspouts direct water at least three to four feet away from the home's foundation. Regularly drain decorative pools and birdbaths; eliminating standing water will help keep termites, squirrels, raccoons, possums, and other rodents away. Use steel hardware cloth (wire mesh that's woven or welded) or galvanized steel flashing. Install hardware cloth on top of screens to prevent larger pests from chewing through. By blocking off the small gaps at the base, which are especially common in older homes, pests are left with fewer ways to get inside. This will also help save money by keeping the heat inside. The chimney is a common nesting site for bats, birds, squirrels, and raccoons. Check the chimney every year before using it, and install a chimney cap to help keep wildlife out. Keep the garage door closed when possible; it presents another barrier for creatures. Check under and behind refrigerators, stoves, and kitchen cabinets. Also, look between the floor and wall junctures, as well as the area around pipes, floor vents, and dryer vents. Plug any gaps with hardware cloth or steel wool. Keep attics, basements, and crawl spaces well-ventilated and dry. Mice and rats love hiding in clutter, especially in lightly trafficked areas like the basement, attic, and garage. Quick tidying can make these areas less tempting; clear out stacks of old newspapers and other junk. Cardboard boxes clustered together and piles of old clothes can be inviting to pests. Store items in sealed plastic containers, and keep them on shelves. Leave no trace of kitchen spills and clean up crumbs—even those beneath the toaster. Pick up bowls of pet food when done; don't leave them on the floor overnight.